Starring: Steve Coogan, Rob Brydon. Just a quick one today! 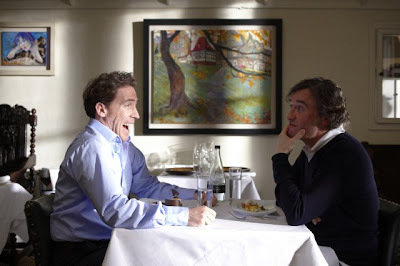 The Trip is enjoyable road movie that puts Brit comics Steve Coogan and Rob Brydon on a posh restaurant tour of Northern England. Each meal serves up plenty of wry British humour as the two funny men riff off one another in improvisational and wine-fuelled banter. As with all good things British, The Trip is also wonderfully poncey and it’s not afraid to offer a waft of pretension. The Trip surely is a talky film, but it’s consistently funny: at least 60% of the dinner banter comprises some spot-on celebrity impressions, with Michael Caine being the best. Director Michael Winterbottom occasionally takes the audience away from the droll chatter to give a peek inside the kitchen and shows the slavish care that goes into making the extravagant meals. I want a duck fat lollypop!